Sometimes it’s the little things in life that puts a smile on our faces. I did a little experiment in the office. Actually, it was quite by accident and more of an observation. Each week I put fresh flowers on my desk because my philosophy is that if I can’t be in the garden, I’ll bring the garden to me. Flowers make me happy and what I observed these past few weeks is that they make my patients happy, too. Each week I walk my gardens in search of one or two stems to place in a small vase that sits on my office desk. Each small bouquet brought out smiles and stories. Some would comment as soon as they walked in at how beautiful the flowers were. Eyes got big and teeth would show. Some would smell the blooms to see if they produced any scent. Some touched the soft and delicate petals to confirm they were real. 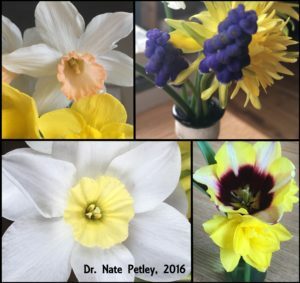 My favorite reactions were the stories that patients shared about their favorite flower or how they loved to pick flowers as a child with a family elder. The point of my observation is that there is great healing in the tiniest of flowers. A single stem can lighten the soul and soften the heart. That spark of joy created by a flower is a powerful thing. Even if for a fleeting moment, flowers can remove heavy burdens. When was the last time you placed a flower on your desk at work or at home just because? Every day is a celebration. Every day we must find a reason to smile and who can resist smiling at a beautiful flower? Apparently not my patients!